The streets are not smiling. The times are tough. A look around my environment each day reveals a society where the hustle has never been more real. The average Nigerian wakes up before the crack of dawn each day to commute several hours to work. A typical commercial bus conveys passengers who sleep through the journey to work because they never get enough sleep at home. From the menace of the Boko Haram sect to the spate of kidnappings, from the epileptic power supply to the death traps we call roads, from the incessant strike actions by various bodies to the dearth of infrastructure in the country, Nigerians are constantly plagued with myriad of problems…yet we stand. In year 2010, Gallup Global Poll rated Nigerians as the happiest people on earth out of 53 countries around the world. While some greeted the news with shock and disbelief, others found it very believable as we have always been known to be a people who smile through pain, confusion and chaos! Little wonder the late Afro beat legend, Fela sang about the typical Nigerians penchant for smiling while suffering. We are an ever optimistic breed of people who continually keep faith that there will be light at the end of our tunnel. Nigerians are the most hardworking people I know, and the average Nigerian will stay on the grind till he makes it. The heroes are definitely not those who are in positions of power, despite the fact that they take decisions on behalf of the general populace (as a matter of fact, they are unarguably the cause of our unending problems) and can decide to be heroes if they so wish. The real heroes are not even the soldiers who are sent to the war front to fight a cause, even though they may lose their lives in the process (at least they were aware of what they signed up for). Neither are the many “Activists” (whose motives are sometimes suspect) the heroes contrary to what a lot of people think. The average Nigerian is the real, unsung hero. We didn’t sign up for what we are currently experiencing. Every 4 years, we become the beautiful bride who gets wooed by some legendary liars, promising heaven and earth if we vote for them. And whether we do or not, they rig themselves into power! During the last presidential elections, one of the prominent candidates had a neighbor to neighbor program which involved his foot soldiers going from door to door to campaign for him. Fortunately or unfortunately, they didn’t get to my door, I had prepared a tongue lashing for them! Yes…call me a frustrated Nigerian, and you won’t be too far from the truth! With each successive government we keep hoping things will get better, and each time our hopes are dashed! It’s amazing how we are still able to get up each day with renewed zeal, determined to make something out of our lives. We trudge on in the midst of darkness and terror in the land. The unsung hero is Mama Nkechi who struggled to raise 5 children into graduates successfully out of her roasted plantain business. The unsung hero is Haruna, the cobbler who treks the length and breadth of Lagos plying his trade in a bid to feed his family. The unsung hero is Bola, an orphan who defied poverty by taking up menial jobs to pay her way through school, refusing to take the easier route that prostitution offers. 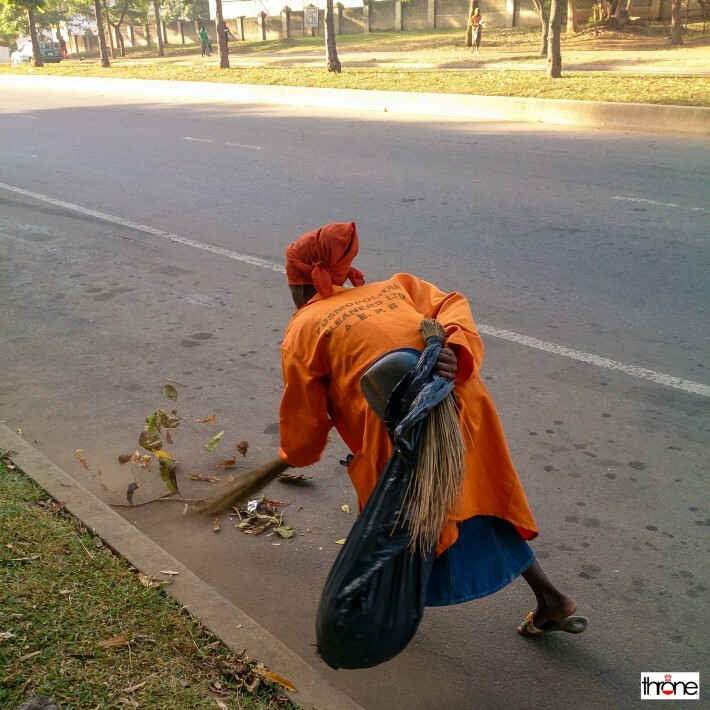 The unsung heroes are the highway managers and garbage collectors who unashamedly wear their overalls, making our streets a good sight to behold for a paltry N18,000 minimum wage. The real heroes are those of us who are passionate about the entity called Nigeria, trying to make it a better place by shunning a life of crime and working our behinds off to make an honest living. We are the unsung heroes…you and I. Nice Piece Lolo, ure needed in d editorial room. Thanks girlfriend! Good to have you back. Nice write-up babe. I believe there will be a better Nigeria someday. Respect to all my brothers and sisters out there striving hard to succeed despite the fact that our country is been controlled by some skunks. God bless Nigeria. #hustlegang #saynotocorruption #Godfirst. Lol, I like the sound of “hustle gang”. Thank you Black Diamond. This is a nice post. I don’t think it could have been better expressed. I salute & dove my heart for all unsung heroes in our part of the world – Nigeria. I hope we can also translate our doggedness for survival into making d right decisions for d right vote and to stand for the truth and common good of all. Thanks sir, I sincerely hope so too…2015 will tell. The way people move about their life in Nigeria especially lagos is so amazing. Someone does the job of conductor, gateman and a cobler, yet he earns less than 20k from those jobs and has 6 children. An igbo man in ibadan had 18 children and to a big surprise all the children got educated till university. wonder how he took care of them.and how do they survive? they don’t live in the best conditions. Some unimaginable yet they carry on with the struggle hoping for the best. Its for this reason Nigeria stands out from the rest. The way we do and think is so unique to us that other african countries can’t be compared to us. Nigeria might have its many problems but I’m proud to be a Nigerian anytime, anyday, anywhere. God bless the hustle and struggle of Nigerians. Very thought provoking article. I think you should take this concept of “Unsung Heroes” a step higher. It is something that Nigerians need to reflect on. Create a hash tag for it and seek for more of those true life examples of such pple that reached the end of d tunnel. It shuld be more publicized. Thank you so much for commenting Dike, and thanks for the suggestion. A beautiful piece Lolo! It merits publication in a national newpaper so that our conscience can prick us if we are part of the problem or part of the solution. Good write up. Wow! You have thrown up so many issues for the thinking person to reflect on. It’s just a shame, the situation is pathetic…but we must keep believing because as they say, the last thing to leave a man is hope. Thank you Abayomi. Indeed Lolade, we are the unsung heroes! Yes we are. Very nice write up. Weldone Sis! Thanks lolo for your insight. Honestly, you got me on this one. And that is because I was expecting some heroes from the woods or outerspace and not you and I that go about our daily business with so much zeal and enthusiasm. Lol @ heroes from outer space…thanks Jola. This is a master piece Lolo!!!!!! !we as people,we have to believe in our selves that we can take our nation to a greater height despite of our individual limitations. So true Ronke. Thank you.